Spare tire covers are usually made to fit snugly around a tire, making removal no quick task. But they can still be removed, and cheaper, bad-fitting models held only by elastic can be removed way too easily. Our Deluxe Anti-Theft Spare Tire Cover solves that problem. The clever design and durable construction means it will be protected from theft while it protects your spare. Instead of a standard fastener, these covers can be installed only when the spare tire is removed. Holes in the cover align with the tires lug nuts, meaning that removing the cover requires removing the tire. These are still tires made by OEM Mopar, as well. They are constructed to Jeep's exact specifications, and are crafted out of a strong denim fabric with heavy-duty stitching. Available in black or khaki, it features the Jeep logo proudly displayed on the back. Because it's made by Mopar, it will match all the rest of your Jeep's features perfectly. 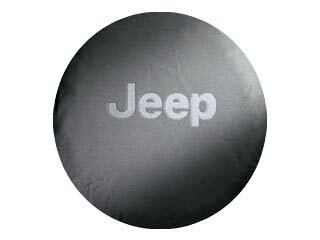 This brilliant custom tire cover for Jeep Wrangler and Liberty models isn't going anywhere. The things that protect your investment also deserve some protection. Item # 82202963AC - Fits Tire Sizes LT30x9.5x15 & P235/70R16? *Cancelled by Mopar*? Easy to install. Nice upgrade! ProsGreat protection for the spare tire! This is the second anti-theft spare tire cover I have purchased. The first was just like the instructions on this web site. It had the plastic center insert which aligns with the lug nuts and makes the Jeep logo perfectly straight. Installation took 5 minutes. With the new one I just bought Mopar has cheapened the design. The plastic insert is gone, and there is just a cloth donut. It took lots of fiddling with the cover to get the logo straight and the fabric stretched over the tire. It took over 30 minutes to install and get it right. I hope I never get a flat and have to install this again. ProsGood fabric, nicely stitched. Looks great on the Jeep. Won't fall off in the car wash.
ConsA royal pain to install, when the older version was child's play.